April 2017 - Sawtooth Mountain Maple Syrup Co.Sawtooth Mountain Maple Syrup Co.
Sawtooth Mountain Maple Syrup Co.
Quite a season as we perform our finale for 2017. It’s hard to quit when the sap keeps flowing, but all good things come to an end. Looking back over the daily journal for 2017, this season proved to be the earliest on record starting our first boil on February 19. Our conclusion was April 14th. Not a record breaking season for us, but we made really great tasting syrup. The majority of the maple syrup we produced being Dark Amber (Grade A). The last phase of our season, is preparation for the 2018 season; Line cleaning! If you are reading this, are a local and looking for a short-term job working in our sugarbush. Please contact us. Must be physically fit and able to carry a water-pack weighing 35lbs. Here is the Wisconsin Sap Report from Roth Sugarbush. There’s never a guarantee as to how much sap we’ll get in a day. Big flows are illusive and we’re hoping in the coming weeks it will hit. Temperatures forecasted look conducive! Since April 1st we’ve been making a lot of Dark Amber – Grade A, and buttery flavored at roughly 325-350 gallons a day. Sugar Content has been holding at 2.5, which is good. But could be better. The sugar sand has been nominal and our pan cleanings have escalated to an every other day thing. ps: I’d be happy to perform that sap dance, if you buy a pint of maple syrup! It’s been a busy week for sugaring. Big runs these last few days have brought us to 50% our seasonal crop. “Doing well!” I’d say … and the sap keeps flowing! 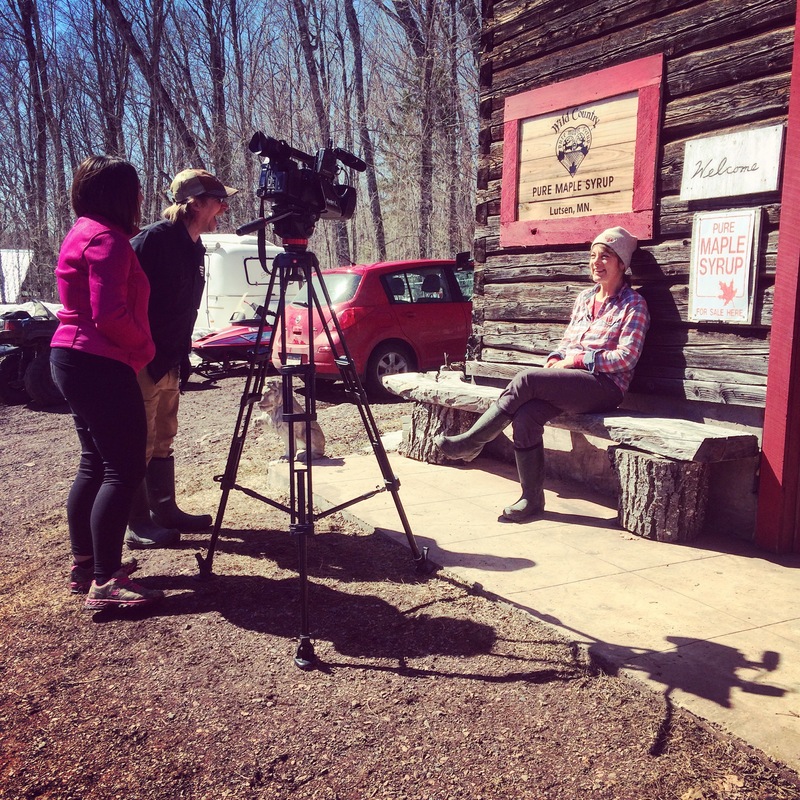 Brittney Merlot from Duluth’s KQDS Fox 21 TV News, interviews Carrie Baker of Wild Country Maple Syrup – Click the picture to zoom – because it’s really cute. Very fun! This past Thursday, we got a visit from Brittney Merlot, Meteorologist of KQDS Fox 21 in Duluth. Northland folks are in for a treat this evening to see and hear all about our maple sugaring from the tree to the bottler. I’m thinking this will be cool and not embarrassing because every time I get in front of the camera I go blah, blah, blah. It was exciting to have a Duluth TV station visiting us and Brittney was so nice and accommodating about interviewing during our seasonal business schedule. I’m sure everyone else did great, especially our partners, Wild Country Maple Syrup. We’re really excited for them because they’ve worked so hard to build their business. Anyhow let me know how the program goes, we don’t have TV here and of course, we’ll be busy boiling! Here’s the Sap Report from Roth Sugarbush in Wisconsin. The color tour – Autumn arrives! Events please! … and now that it’s summer, let us enjoy. We interrupt Spring to bring you the return of Winter. The Word is the Bird!